Mr. Young is a partner of the firm. As an attorney with a degree in civil engineering, his practice focuses primarily on construction and commercial real estate transactions and litigation. Given his civil engineering background, Mr. Young has the ability to understand both the technical and legal aspects of all levels of construction and real estate. 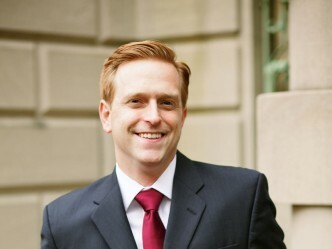 In addition to representing clients with construction and real estate matters in and around Boston, Mr. Young is an attorney for many property management companies, biotech and laboratory companies, food trucks, restaurants and retail stores. Prior to joining the firm, Mr. Young worked for a large law firm in Detroit, Michigan where he represented large contractors and public agencies in all facets of litigation, including construction, real estate and labor/employment. In Michigan, Mr. Young litigated and settled complex NLRB and ERISA cases on behalf of large and small clients, drafted complex employment documents and negotiated employment and labor disputes on behalf of large management clients. While attending the New York Law School, Mr. Young was an Executive Editor of the Moot Court team where he competed in, and coached, teams in several national moot court competitions. He was also vice chair of the New York Law School Public Interest Coalition. During his undergraduate studies at Michigan State University, Mr. Young was the Business Manager of the Michigan State Yearbook, Comptroller of the Associated Students of Michigan State University and the Senior Class Council President. Mr. Young is admitted to practice in Massachusetts and Michigan. He is also admitted to practice in the Eastern Federal District Court of Michigan, the Western Federal District Court of Michigan and the Federal District Court of Massachusetts. Negotiated multiple and multi-layered commercial lease transactions for large biotech and pharmaceutical companies in Cambridge and Boston Massachusetts. Represented several local restaurant chains by negotiating commercial leases and construction contracts for restaurant operations. Represented London-based international company for its Boston office space. Represented California-based biotech and medical device company in negotiations for multiple laboratory and office spaces in Boston. Represented Boston-based property developer in the negotiation of several retail leases for a clothing store, cellular phones and a Dollar Store. Represented large publicly-traded pharmaceutical company in the negotiation of several laboratory and office space leases. Represented national property management company in lease negotiations for company headquarters. Successfully negotiated and closed business buyout on behalf of a growing restaurant chain thereby tripling the size of its operations and footprint. Successfully negotiated and closed business merger of two large, national construction suppliers. Successfully obtained dismissal of $1.5 million RICO claim asserted against a national property management company and its owner. Successfully obtained dismissal of employment claims against corporate client and was awarded sanctions against opposing counsel. Successfully obtained dismissal of mold litigation case asserted against a national property management company. Assisted in the defense of former President and CEO of regional bank from shareholder derivative claims seeking damages in excess of $90 million. Successfully settled large claim against automotive parts manufacturer on behalf of a prototype developer. Successfully obtained injunctive order on behalf of a franchisor for several violations of a franchise agreement. Obtained dismissal of medical malpractice claim for psychiatric facility. Obtained favorable mediation award for a dispute of ownership and accompanying derivative action of a national consulting business. Successfully settled multi-layered franchise dispute with international franchise corporation and successfully negotiated buyout terms on behalf of franchisees. Negotiated settlement on behalf of general contractor for multi-million dollar hotel renovation project. Obtained sizable settlements and avoided lengthy, protracted litigation for various midsize construction contractors in disputes with other contractors, land owners, project developers and state agencies. On behalf of small and mid-size construction contractors, successfully settled several Employee Retirement Income Security Act (“ERISA”) litigation cases. Second-chaired week-long eminent domain trial for municipal authority. Assisted in successfully settling complex eminent domain litigation matter on behalf of municipal authority involving the taking of multi-use commercial office complex for the construction of a traffic roundabout. Assisted in settling complex eminent domain litigation matter on behalf of municipal authority involving the partial taking of a muli-million dollar gas station, car wash and convenience store.